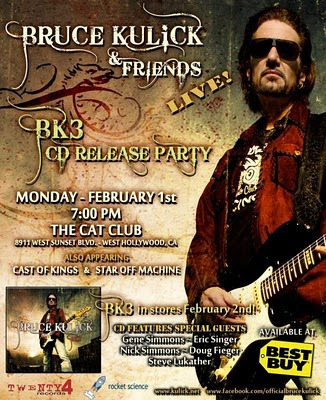 BK3 is the title of the published in 2010, the third solo album by Bruce Kulick, guitarist of the American band Grand Funk Railroad. Five of the eleven titles sings Kulick himself and five others are sung by other artists. In addition, the album includes an instrumental piece written by Kulick and Steve Lukather (guitar, Toto ) was added, the jazz bassist Jimmy Haslip and Kenny Aronoff ( John Mellencamp, among others, for John Fogerty and drums). The album was recorded at a total of fifty days in various studios in the greater Los Angeles area. Kulick began work on the drum tracks, which were of Brent Fitz, his bandmates, taken from the time at Union. As Kulick and co-producer Jeremy Rubolino had all demos thoroughly prepared and able to work with the program Pro Tools, it was easy for Fitz, on the first day of admission four titles einzuspielen; on the second day the drum tracks for ten titles were added. The bass tracks for many of the songs have been recorded by Kulick himself, partly also took Rubolino this task. 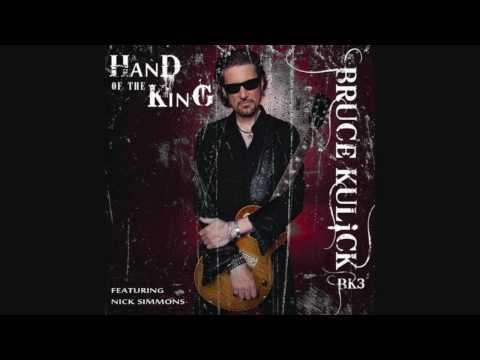 Other famous musicians who supported Kulick in the recordings were Eric Singer, who drums for the song sung by Tobias Sammet I'm the Animal played, the deceased shortly after the recording singer of The Knack, Doug Fieger ( Dirty Girl ) Kiss bassist Gene Simmons ( Is not Gonna Die) and his son Nick ( hand of the King), also Kulicks partner in the founding of the Union, John Corabi, of the song No Friend of Mine wrote the song with him and took over. Furthermore, Kulick took on an instrumental title ( Between the Lines ), on the next to him and Steve Lukather plays guitar. Further, in the recording Jimmy Haslip (bass) and Kenny Aronoff participated (drums). In a review of the German magazine Rock Hard alluded and hinted that the band's fans become synonymous with excellent sales figures for Kulicks product are on Kulicks time as guitarist of Kiss. "Mr. Kulick cynical to assume calculus, because as a singer on the album alongside baggy tongue Gene Simmons ( 'Is not Gonna Die ') also the son of man ( ' Hand Of The King' ) and Eric Singer (along with Tobias Sammet on 'I'm the Animal ') appear, but the album did wrong, because tracks like the jaunty ' Uplifting ' and the atmospheric ' No Friend of Mine "( with John Corabi on vocals ) are raised and prove beyond any criticism that it Kulick with " BK3 " primarily comes to live out his own musical ideas. Hard Rock and Classic rock fans can note on your shopping list the album. " Allmusic reviewer Greg Prato said, in " the wake of recent publications from the Kiss environment " ( Ace Frehley Anomaly and Kiss Sonic Boom 's own work, both 2009) befände Kulick is "clearly on the road to victory ." Alexander Kolbe from the magazine Rocks awarded four out of six possible points and noted that even if from Kulick " in this life no more gifted singer " would be, as was " he does a better figure than with the Kiss - number> I Walk alone < (from Carnival of Souls ) ".